Constable Jas. Quinn was at one of the houses on the Sand, during Friday night, to look after some parties, when he was assaulted by Wm. Reese, the proprietor of the establishment, who knocked him down by a blow from his fist, and kicked him in the side, breaking one of his ribs, Quinn was led home, but during the next day he refused to obtain medical aid, and kept about his duty as usual. On Saturday evening, after he had retired, a warrant was brought to him for the arrest of a man supposed to be aty one of the houses on the Sand. On his arrival there, he was struck several times by Rees, and finally thrust out of the house. From the injuries received on both occasions, Quinn died at 11 o’clock yesterday afternoon. Coroner Hines held an inquest over the body of the deceased, and a verdict was rendered that James Quinn came to his death from kicks and blows inflicted by Wm. Rees, thereby causing congestion, and the breaking of his sixth rib. Rees was arrested and lodged in Jail to await examination. Yesterday afternoon, about 2 o’clock, officer Casper Lower1, of the Day Police, arrested on Edina Place, between Polk and Taylor streets, an Irishman named Patrick Cunningham. He started with his prisoner for the Watch House, but on arriving at the corner of Jackson street and Edina Place, Cunningham suddenly grabbed the officer’s cane from him, and at the same time caught hold of a tree, thus refusing to proceed any further. We heard it stated during yesterday afternoon that the prisoner declared “he would be d—ed if he would go any further.”—A scuffle immediately ensued between the two, during which Lower received a mortal stab in the left side, between the fifth and sixth ribs, which caused his death in less than ten minutes afterwards. The wound was inflicted with a large bowie knife—the blade being eight and a half inches long, and one and a half inches wide. After receiving the stab, Casper struck his murderer two heavy blows over the left side of his head with his cane—having previously recovered it from him. Cunningham was knocked into a gutter, bleeding profusely. An express wagon coming along, the dying officer was assisted into it by the driver, who was ordered to drive immediately to the nearest drug store. During this time, a number of citizens were assembling near the spot, and Lower spoke to them, requesting that Cunningham should not be allowed to escape, and said, “he’s the man who stabbed me.” These were the last words he uttered. The officer had presence of mind enough to take the knife into the wagon with him, and also to wind his handkerchief around it. He was not probably aware how seriously he was stabbed, although he bled profusely from the moment he received the wound, and his clothes were soon saturated with blood. The knife is supposed to have struck the heart, and it drained his body of all its blood in a few minutes. The express wagon was driven to the drug store of Dr. M. Jerome, on the corner of Adams and Clark streets. Dr. J. was called out, and found Mr. L. sitting on the seat, alongside the driver, leaning on him and vomiting. He was laid on the floor of the wagon, and Dr. Jerome proceeded to examine his wound. He found it still bleeding, and could penetrate it with his finger to the heart. Finding that no earthly power could save the man, the wagon drove to the police office at once. Mr. Lower did not make the least motion to speak from the first that Dr. Jerome saw him. It is supposed that he died immediately after leaving the store, as he he was dead on reaching the Watch House. An immense crowd quickly collected in Court Square, and great excitement prevailed. All sorts of stories were being related, and it was at one time difficult to fully decide on the state of the case. The intelligence soon spread, and officers were dispatched to the scene of the fight. They found Cunningham in the gutter, bleeding from the wounds on his head, and conveyed him forthwith to Jail. The prisoner, in answer to questions from the Mayor and our Reporter, said that the officer was stabbed by some person to him unknown; that about an hour and a half previous to the fight, he had a dispute with another Irishman named McCann—Patrick, he believed was his christian name; that the trouble was in relation to different parts of Ireland, “and,” said he, “Irishmen you know are always disputing.” He also said that he and McCann had been acquainted about three weeks, that for the past few days they had been drinking together, and that McCann was a tailor by trade, lived on the West Side, but he didn’t know in what exact locality.This story however was not believed, as the prisoner when first put into his cell said that he did not know what name of the third man was, and made other statements altogether different from what we have related. I was standing on a door step, on the corner of Edina Place and Jackson street—the first I saw of the fracas was two persons standing on the corner, in a scuffle—thought they were boys fighting—one had a knife in his hand, and the other a pistol—both also had a hold of a cane, and ech was striving to get possession of it—the officer held his pistol in his right hand, the man with the knife held it in his left hand—this was when I first saw them. Where Captain Nichols, of the Police, afterwards found it. The man was endeavoring to use his knife—did not see the stab given—saw several blows given with the cane—saw the officer go away in the express wagon, and the crowd gather—knew he had been stabbed, but did not see the knife enter his side—there were no others in the affray, and no one standing near by. The other witnesses were not examined. The knife made an incision through a thick coat worn by the deceased, also through his vest, making a clear passage to his heart—the blade of the knife fitted the cut in the garments. IXL—Geo. Wostenholm & Son—CALIFORNIA KNIFE. The knife that killed officer Casper Lower was probably similar to this one. The same name was also on the hilt, with the addition of “Washington Works.” The handle was a polished black, with a piece of silver on one side, and both ends covered with ivory. The Jury returned a verdict that Casper Lower came to his death by a stab in the heart with a bowie knife, in the hands of Patrick Cunningham. He leaves a wife and three small children in this city, but in good circumstances. He also has here three sisters and one brother. His mother resides in Buffalo. The members of the Council, at their meeting yesterday, resolved to attend his funeral this afternoon, in a body. When the Great Fire devastated our city in October, 1871, virtually all Chicago Police Department records were destroyed . Thus, it is difficult to determine exactly how many Chicago police officers have died in the line of duty. After extensive research it has been determined that the first Chicago police officer killed in the line of duty was most probably Officer Casper Lauer on September 18, 1854. 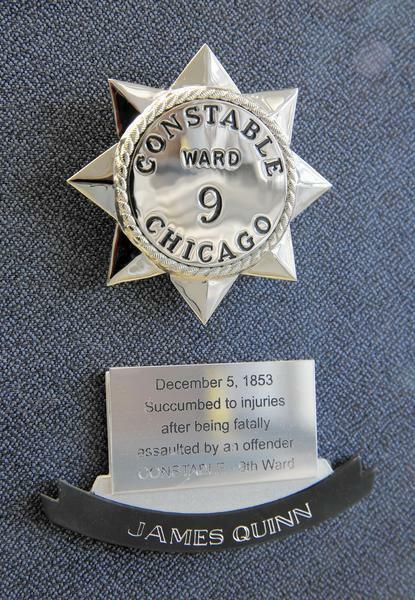 The first Chicago officer to have his star permanently retired and placed in the Superintendent’s Honored Star Case was Officer Patrick O’Meara, killed in the line of duty on August 5, 1872. Casper Lauer, of German descent, was born in France in 1820; came with his parents to the United States in the early 1830s; arrived in Chicago about 1840; and joined the Departmentin 1849. About two o’clock in the afternoon on September 18, 1854, Lauer, a member of the Department’s “Day Police” ar· rested an offender named Patrick Cunningham. As Lauer escorted him to the watch house (police station), a struggle ensued during which the offender pulled out a knife. The weapon was described as “a wicked looked instrument” with a blade eight and one-half inches long and more than one inch wide. A witness later testified that during the struggle the officer drew his service revolver but the knife-wielding offender said, “Don’t shoot and I’ll be safe!” (indicating he would cooperate). Lauer then said , “No, I’ll not shoot you” and placed his revolver in his right coat pocket (where it was found later by Lauer’s superior officer, Captain Nichols). Despite the wound, Lauer was able to strike two heavy blows to his assailant’s head with his Department issued “cane”. The offender fell in the gutter, bleeding profusely. The officer had the presence of mind to take the knife into the wagon with him. The officer, vomiting and his clothes “saturated with blood”, was examined by Dr. M. Jerome who determined “that no earthly power could save this man”. Lauer died shortly after. Fellow officers arrived at the scene of the murder where they arrested Cunningham, still lying in the gutter. Lauer’s funeral, held the day after his death, was attended by a large crowd including the mayor, Department officers and other law enforcement personnel, and members of the court. Lauer was survived by a wife and three young children. This monument was erected by the City and County Officers as a tribute of respect to his memory. A Policeman of the City of Chicago killed in the discharge of his duty. One account refers to Lauer as “the oldest Policeman in the city service” which is remarkable whether it refers to his age (34) or his length of service with the Department (five years). A dedication ceremony was recently held for the installation of Casper Lauer’s marker. 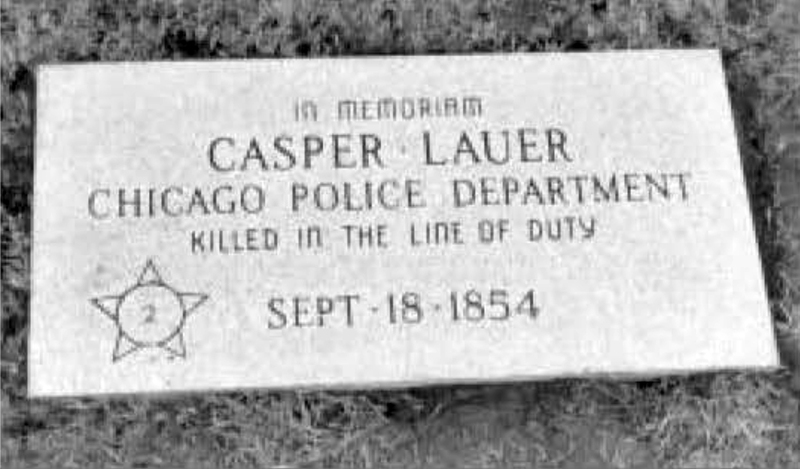 Lauer was the first Chicago Police Officer killed on duty. Installation ceremonies for the remaining sites are planned for the spring. Superintendent Terry Hillard speaks at the dedication ceremony honoring Casper Lauer, the first Chicago Police Officer killed in the line of duty. In 2002, Rick Barrett, the U.S. Drug Enforcement Administration’s section chief for Mexico and Central America, stumbled across an obscure record while researching the careers of his father, grandfather and great-grandfather, all Chicago cops: On Feb. 27, 1854, a Margaret Quinn petitioned the city for widow’s compensation because her husband had been “deprived of life … in the honest and faithful discharge of his duty as an officer of the city.” The city government agreed, and authorized a payment of $50. Barrett’s research makes the case that bigotry of that era left Quinn expendable and forgotten. Barrett’s evidence, largely from primary sources, was published originally at ConstableQuinn.com (no longer active) and has been reproduced from web archives below. 1. Never made any reports to his superiors. 2. Did not follow proper police procedures, policy, rules and regulations. 3. Rees was arrested AFTER Quinn died. 4. Rees was only arrested AFTER the Quinn family told the police about Quinn’s dying declaration that Rees kicked him. Note: The historian never offered any specific reason for advancing these unfounded claims and in fact, even when pressed never articulated his basis for belief. Rather, he just threw these wild allegations out and never offered any credible evidence in support of his unexplained beliefs. The evidence regarding the aforementioned Common Council document was discovered after the March 29, 2006, letter of First Deputy Superintendent, Dana V. Starks, in which he claimed the Awards Committee “reconvened” on March 22, 2006, to reconsider Constable James Quinn’s case and decided “not to approve placement of his star in the Superintendent’s Honored Star Case’ because “no new evidence was presented at a January 9, 2006 presentation on the case .” In reality, much new evidence was presented but apparently it was just not considered. “An Ordinance Creating and Regulating the Police Department” — May 12, 1853. Section 5: The several Police Constables, whether elected by the people or appointed by the Common Council are hereby required to devote their attention to the preservation of the peace, quiet and good order of the city and the enforcing of the Ordinances thereof, more especially in their respective wards and districts. They shall severally report themselves for duty at such times and places as the Mayor or Marshal shall direct , and render such prompt and energetic assistance as may be required of them, or the exigency of the service demand. It shall be the duty of each and every constable, when required by the Mayor or Marshal, to do duty and serve as policeman or watchman, as the case may be, and every constable while doing regular duty and service as policeman or watchman, shall perform the same services, be subject to the same regulations, and receive such compensation as may be fixed by the Common Council and while so doing regular duty, shall not serve any civil process or do any other business, or service that will interfere with his duties as policeman or watchman. 1. Saturday night Dec. 3, 1853 , after he had retired for evening, an arrest warrant was delivered to Quinn at his residence and he was ordered back to the Sands to find the man who had escaped from him the night before. 2. It is not clear at what time Quinn entered the house of Crosby & Perry. Crosby put it at 10:00 p.m . Perry puts it at 11:00 p.m.
3. Saturday before 12 o’clock midnight — Rees attacks Quinn in house of Crosby & Perry for second time in as many days. 4. Quinn departs just after midnight telling Rees he will see him another day. 5. Sunday near 1: 00 a.m. — Both Rees and Parmilee are still free men at this time. 6. Later Sunday early a.m. — Perry said he saw Quinn back at his house on the Sand . 8. Monday morning 0800 – Both Rees and Parmilee are in custody and appear in Police Court …. The Missing Link: When, how & by whom were Rees and Parmilee arrested? 9. Rees discharged at 8:00 a.m. court call; Parmilee held on $800.00 bond. 10. Later that same morning, Rees rearrested by City Marshal Howe. 11. Monday, Dec. 5th 1853 — Quinn dies at 11:40 a.m.
12. Tuesday, Dec. 6th 1853 — DDP reported that Quinn had made arrest of individual who had escaped from him Friday night, Dec. 2nd. 15. The Missing Link Found: Common Council File #1272 dated December 12, 1853 — “Mayor and Clerk’s Report of Bills Paid and Duly Certified” for $26.00 points to the missing link . It suggests that all 26 men of the Night Watch performed “extra services” by going to the Sands Sunday morning, Dec. 4th to look for and arrest Rees and Parmilee. They each worked from 5:00 a.m. (the end of regular shift) to 12:00 noon …a total of 7 hours. Seven hours’ times 14.3 cents per hour equals $1.00 for each man…since there were 26 men, it makes perfect sense that the Night Watch was paid $26.00. It all fits. 16. It is interesting to recall that on December 18, 1853 , the entire Night Watch of 26 descended on Sands pursuant to the Dec. 12th Order (File 1277) and arrested about 20 persons. 17. The Night Watch consisted of 26 men at this time according to the Chicago Journal and Tribune Dec. 19th and 20, 1853. Given the fact that both Rees and Parmilee appeared in custody in front of the Police Court Judge at 0800 Monday morning December 5, 1853, just how was it, by whom, when and where were they arrested? Note: In December of 1853, the Night Watch consisted of 26 men. Since the hourly pay rate was 14.3cents per hour each man had to have worked extra services for seven hours ( 5:00 a.m. to 12 o’clock noon ) because 7 times 14.3 cents equals $1.00. 26 men times one dollar each equals exactly $26.00. This is how both Rees and Parmilee appeared in Police Court at 0800 on Monday morning, December 5, 1853 . Further proof that the arrests of Rees and Parmilee took place Sunday morning lies in the fact that it could not have occurred at any other window of time and had Quinn present. We know with 100% certainty that Quinn was too ill to have worked between 12:00 midnight and 8:00 a.m . Monday morning, December 5, 1853 . In fact, he was dying at that time. So we know for certain that Rees & Parmilee were not arrested during the first 8 hours of the day on Monday Dec. 5, 1853 . This only leaves Sunday December 4, 1853 , as the only day in which they could have been arrested . We know Quinn was home in bed beginning around noon on Sunday Dec. 4th…so there was no way Rees and Parmilee were arrested after 12: 00 noon on Sunday…. Therefore, the only window of time that Quinn could have been present (as stated in the Daily Democratic Press of 12/06/1853 ) and have made the arrest with the Night Watch was sometime after 5:00 a.m. and before noon on Sunday, Dec. 4, 1853 . This all had to have transpired because Quinn had to have reported the Saturday night assault on him by Rees to the Captain of the Night Watch at the End of Night Watch roll call at 5:00 a.m. This was done by Quinn in accordance with all of the above cited Police Rules. It is critically important to note & understand that the Mayor and Clerk had to have received the bill from the City Marshal and reviewed and approved the same during the work week of Dec. 5 to Friday Dec. 9th in order for it to have been on the agenda for the Common Council meeting held on Monday December 12th 1853 at which time it was, in fact, paid. Since the actual work was performed on Sunday morning, December 4, 1853 from 5:00 a.m. to noon ….the bill would have been processed during the coming work week of December 5 to 9, 1853 . The simple fact is this: There occurred NO OTHER event in Chicago during this whole time period that would have caused the Night Watch to have been called into “extra services” The extra services relative to the Quinn case was the only possible reason the Night Watch was paid $26.00 at this time. It all fits. The September 19th payment was made pursuant to the September 7th and 8th investigation of the shooting of the famous Mr . Alan Pinkerton , then a Deputy Sheriff for the Cook County Sheriff’s Office, who was shot on September 7, 1853, at 11:30 pm at the corner of Clark and Monroe…The resultant investigation was pursued all night into the morning hours and the offender was never arrested. Mr. Pinkerton worked until about noon helping to try to find the offender but was too weak to work into the afternoon. The “Mayor’s Bill” of March 6, 1854 , for “Extra services by the Night Watch” was relative to an incident that occurred at midnight February 28, 1854, with the arrest of a burglar that started a series of investigative events that rolled well into the morning of March 1, 1854 . These “extra services” resulted in a major burglary ring having been broken up by the Night Watch. Arrests started at midnight and subsequent search warrants were obtained and executed during the early morning hours of March 1, 1854 . Five men were arrested. From the newspaper articles it is clear that the investigative work developed over night and well into the morning. The leads were turned over to Casper Lauer of the Day Police when he began his regular shift at 9:00 a.m. Later in the morning , Lauer arrested fellow Frenchman, Eugene Lemier, the alleged chief of the burglary gang. This new piece of evidence is very telling. It answers a question heretofore unsettled. It represents the final missing piece of the jigsaw puzzle that comprises this case. To be fully appreciated, it must be considered in concert with the totality of the other facts and circumstances of the Quinn jigsaw puzzle. It is new evidence that answers the question: How did Rees and Parmilee end up in jail such that they were presented in court in custody at 0800 Monday morning? Further, it dispels the unfounded allegations advanced by the Police Department’s so-called historian, who alleged that Constable Quinn did not follow police policy, rules and procedures. Hopefully, the historian will somehow muster the integrity and courage to appear at the next meeting of the Committee on Police and Fire and at that time brief the Committee as to his basis for believing and advancing such unfounded charges. An analysis of all of the Mayor and Clerk’s Bills approved under the 1853-54 Administration of Mayor Gray showed only three times where the Night Watch was paid for extra services….these events involved the shooting of an officer (Pinkerton) the beating of an officer (Quinn) and the breaking up of a gang of big time jewel thieves (Lemier and four others). The rarity of the Night Watch working “extra services” can not be overstated. In any fair analysis, it must be taken into account when examining this aspect of the Quinn case. : There was no other event that occurred during the first week of December that would have caused the Night Watch to perform “extra services” other than the Quinn case. In this case, the Night Watch was dispatched on early Sunday morning December 4, 1853 , to descend on the Sands and to find and arrest both Rees and Parmilee. This all had to have occurred because Quinn reported the assault perpetrated on him by Rees to the Captain of the Night Watch Owen McCarty and the Lieutenant of the Night Watch, James Donohue…as there was no way he would have reported it to his political nemesis, the Know Nothing Luther Nichols, Captain of the Day Police — whose informant was none other than the offender, William Rees. Chicago police may soon have a new cop to honor as its first officer slain in the line of duty. In an about-face from previous police administrations, Supt. Jody Weis has applied to add Constable James Quinn to the National Law Enforcement Officers Memorial, saying he was killed in the line of duty in 1853. He was fatally beaten. If approved Friday by a committee of the Washington-based memorial foundation, Quinn would bypass Casper Lauer, stabbed to death in 1854, as the first officer killed in Chicago. Previous superintendents decided that the constable did not meet the criteria to be classified as an on-the-job death, rankling at least one city official and a former Drug Enforcement Administration officer, who have crusaded for years to include the officer. Police officials have long debated the circumstances of Quinn’s death. Opponents believe that he died during a drunken fight in The Sands, a shantytown of brothels and saloons that is now the Streeterville neighborhood. Supporters insisted that the officer went to the area to arrest a thief and that unreliable witnesses concocted the fight. In 2007 the Chicago History Museum conducted an 11-month investigation into the officer’s death at the urging of the City Council, led by Ald. Edward Burke3 (14th). Historians determined that he indeed died in the line of duty. Weis said Thursday that the department’s Honored Star Committee, made up of senior department staff, recommended Quinn be added to the national memorial. Weis said he decided that there was enough evidence, even if not definitive, that Quinn was killed in the line of duty. 1Some sources incorrectly spell Lauer’s name as “Lower”, a phonetic spelling.